Everyone is constantly looking to save money these days, especially with the poor economy that’s in no rush to turn around. Groupon for the iPhone and iPod Touch is a unique money saver app that will definitely save you a few bucks here and there. 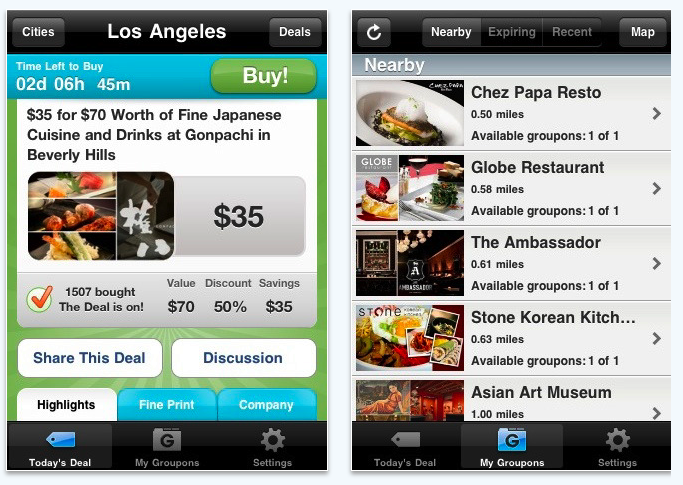 The application, developed by Groupon, Inc, has a parallel, stand alone website that supports each city supported by the app. For those unfamiliar with Groupon, it is basically a group discount made available because of the amount of people that Groupon can guarantee a retailer. For example — a furniture store can offer $300 worth of merchandise for only $100 to Groupon users with the hope that the furniture store will eventually make more money through building their consumer base. Although the deals are limited time only, they usually last anywhere from one day to three. Groupon works geographically depending on your location, and presents you deals available in your area. Just like the website the app brings you the same deals. Once you have downloaded and opened the Groupon app, you will be asked to enter your zip code. After this, setup is complete — and you will automatically be told what deals are in your area. One useful thing to know is that Groupon is programmed to send you an update as new deals arrive, so you’ll never be left without a daily deal. A simple settings menu allows yo to make the new updates silent or allow them to continue uninterrupted. I really like the collection of deals that you can find on Groupon because there can be anything from guitar lessons and movie tickets to a dinner for two and cheap furniture. While I may not take advantage of every advertised deal, the variety of offerings is certainly worth keeping the app installed and checking it on a daily basis.